SE Uplift has two office spaces on our main floor for rent, as well as 408 square feet of office space in the basement of the building for rent. The basement space includes two office spaces and a reception area or lobby (option for a third desk or waiting room) and two additional storage spaces on the same level. 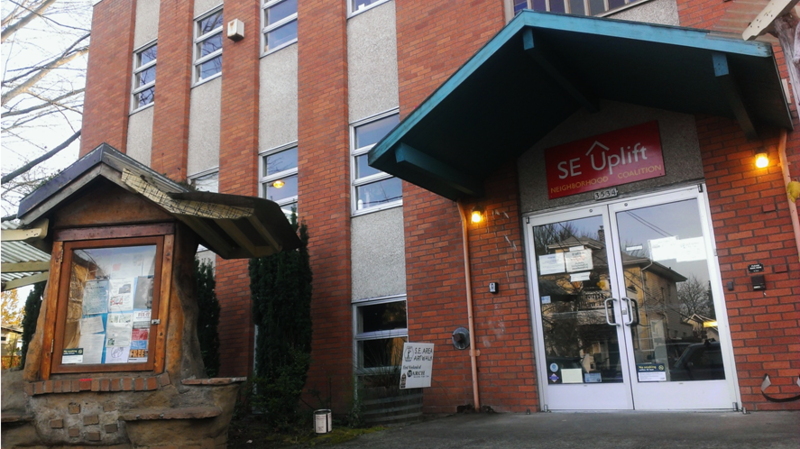 SE Uplift’s office is located just off of Hawthorne Blvd. The building is blocks away from popular restaurants, bars, shopping, and coffee shops. It is a few blocks from Public Transit and has a Walking Score of 96 (Walker’s Paradise) and a Bike Score of 100 (Biker’s Paradise). To arrange a time to view the available spaces, please contact Sydney Mead at sydney@habitatepropertymanagement.com. To apply to rent the space, please submit a completed application form and responses to our supplementary questions to Sydney. The spaces are open until filled but SE Uplift will begin reviewing applications on Monday, April 16th. For tenant eligibility and selection criteria, please see below. For more information please contact Sydney Mead with Habitate Property Management at sydney@habitatepropertymanagement.com or 503-358-5773. • Be a 501(c)3 organization, organization with fiscal sponsorship from a 501(c)3 organization, community group, or a social enterprise. • Activities must support and further SE Uplift’s mission and the following goals: Increase the number and diversity of people who are involved and engaged in the community; strengthen community capacity to create change by building community leadership, identity, skills, relationships, and partnerships; and increase community impact on public decisions and community life. • Demonstrate financial stability capacity to pay rent and obtain commercial general liability insurance. • Organizations set up for partisan political or religious reasons. • Organizations whose activities have an adverse impact on the building.